There is an emerging body of cross-disciplinary research and public discourse that argues for an increased recognition of the complex connections between the environment and health and wellbeing (Taylor 2017). Disciplines such as human (or cultural) geography and its sub-field of health geography (known variously under other names, such as geography of human well-being, geography of pathology, geomedicine), already consider ‘the environment’ a health space, integrating a holistic perspective of geography and health sciences, with other fields, such as sociology and biology (Mercadal 2016). While other disciplines such as health geography are moving to include new perspectives into how environments and health can be connected, environmental health, or the explicit integration of the two concepts as an area of knowledge in Health and Physical Education (HPE), is still severely underrepresented, both in academic research and practice (Taylor 2017). Australian Curriculum Assessment & Reporting Authority. (2017a). Cross Curriculum Priorities, Sustainability, In the Learning Areas: Health and Physical Education. Retrieved from https://www.australiancurriculum.edu.au/f-10-curriculum/cross-curriculum-priorities/sustainability/. Australian Curriculum Assessment & Reporting Authority. (2017b). Curriculum Connections: Portfolios, Outdoor Learning. Retrieved from https://australiancurriculum.edu.au/resources/curriculum-connections/portfolios/outdoor-learning/. 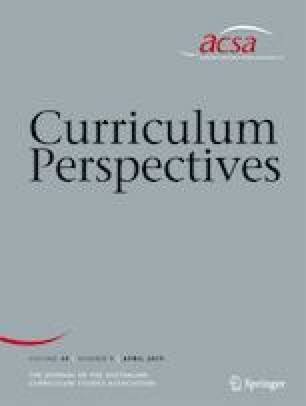 Australian Curriculum Assessment & Reporting Authority. (2017c). Health and Physical Education: Glossary. Retrieved from https://australiancurriculum.edu.au/f-10-curriculum/health-and-physical-education/glossary/?letter=D. Mercadal, T. (2016). Health Geography. Available from EBSCOhost Research Starters Retrieved 12/2/17, from Salem Press Encyclopedia http://ezproxy.uow.edu.au/login?url=http://search.ebscohost.com/login.aspx?direct=true&db=ers&AN=113928144&site=eds-live.